As promised, this week I'm concluding my look at the 10 best educational games of Ludum Dare 23. (You can check out the first part of the list here.) After playing through more Ludum Dare games than I care to count, the 5 games that I've listed below appeared to me to strike the best balance between having truly educational content and interesting gameplay. Remember, all Ludum Dare games are free to play, so nothing should be stopping you from giving these games a try! Tiny Shipping puts players in charge of a fleet of three large ocean-freighters and gives them the chance to become cargo shipping moguls. Shipping requests will pop up periodically at the top of the screen telling players at what port cargo currently resides and where that cargo needs to be delivered too. Player then dispatch a freighter to retrieve the cargo, drop it off at the destination port, and collect cash for their hard work. The interface is simple and the graphics are clean, although the actual control of the ships is ultimately more frustrating than fun. The game's hit detection between ship and land is a little too unforgiving, and it's all too easy to run aground when stopping at a port to pick up or drop off goods, or when trying to navigate through narrow spaces like the Panama Canal or the West Indies. The tricky mechanics of sailing each vessel also makes it almost impossible to set all three of your ships in motion at once. You're certain to accidently run one aground while you're trying to gently steer another one into port. These difficulties don't make the game unplayable by any means, but they're are a weakness which detracts somewhat from the enjoyability of the game. However, with tighter controls for managing ships and the fleet, Tiny Shipping could prove to be an exceptionally fun little tool for learning some international geography. 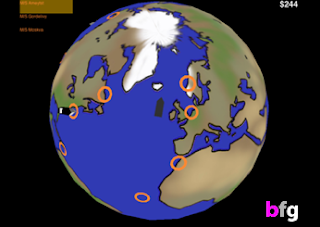 Even though the goal of the game is to transport goods for profit, players must know some basic geography in order to steer ships to the correct locations. There are some in-game hints: a port in need of a pickup will flash, giving players a chance to learn the names of unfamiliar places. But players must figure out destination ports on their own, which makes players have to learn and learn quickly. And the more quickly players develop their sense of geography is, the better their chances for profit: instead of arbitrarily selecting a ship for each mission, players are better served by choosing the one closest to the given pick-up point. This means that if your M/S Moskva is currently in the Atlantic, you should probably choose a different ship to pick-up cargo in Shanghai. Similarly, a trip from Cape town to Cape Verde is easy money, but New York to Sidney will take considerably more travel time, so more knowledgeable players can be more strategic in choosing which missions to complete. I admit that some of my love for Tiny Shipping undoubtedly springs from my long-standing enamorment with the Uncharted Waters series from back in the NES/SNES era. But what I remember of such games is more than just nostalgia. It's because of those games that I know where port cities like Lisbon, Oslo, and Cape Town are today. With a little expansion, like setting goals for players and enabling them to gradually expand their shipping empires, and maybe even incorporating descriptions of cargo appropriate to the shipping port and destination, I could see Tiny Shipping blossoming into a modern version of those old economic/shipping simulation games, giving players the opportunity to build their geography skills as well as learn about the markets that thrive in our current global economy. 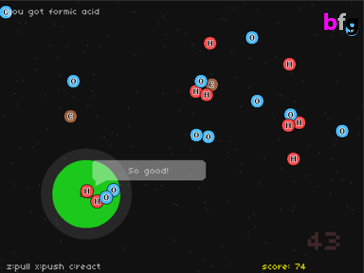 Synthesis is a fun little puzzle game that will make most of us wish that we'd paid more attention in chemistry class. The basic premise is that you are a scientist who has managed to shrink yourself to "nano-size." Now you navigate the world in your special nano-ship and try to bring atoms together into stable molecules. There isn't much more of a goal than this, but it's a playful enough conceit to make it seem natural to make chemical compound the center of this puzzle game. But success at Synthesis requires more than just a keen sense of chemical compounds. There are also arcade-like elements to the gameplay in how the player's nano-ship is controlled. The ship moves much like the ship in the classic game Asteroids, and players are challenged not only to figure out what atoms they can fuse together, but then to actually arrange those atoms together in a cluster on the playfield. On the one hand, this mechanic sits in tension with the basic premise of creating chemical compounds--the physics of controlling the ship and the atoms is a bit slippery, and it can sometimes be quite frustrating to see the ingredients for a great compound and still not be able to maneuver the pieces together. At the same time, the arcade elements make the game much more riveting than just an exercise out of a chemistry book. Evening knowing only one or two formulas, skillful players can still rack up the point zipping around the playfield and creating simple compounds. In its current form, Synthesis is fun, but it suffers from the lack of instructional materials. There is no guidance for the chemistry-naive player about what can be fused (although developer marudziik has created a supplemental page listing the recognized compounds), and the game has no levels or other progressive structure whereby players could master basic formulas with elements like hydrogen and oxygen before moving on to more complicated compounds involving carbon, sulfur, and phosphorus. Instead, all possibilities are thrown at players at once, and yet the game is simultaneously parsimonious with atoms other than oxygen and hydrogen, forcing players to do a lot of repetitive fusing of water, hydrogen peroxide, oxygen, and the like. Still, Synthesis stands as a strong prototype for a more developed game which could appeal to the puzzle-game crowd, the arcade lovers, and the chemistry student in us all. The world of Marceline is an unsettlingly grim one, and this historically-themed game serves as a poignant reminder of the horrors of the Holocaust. Inspired by French filmmaker and Holocaust survivor Marceline Loridan-Ivens, this game isn't overly strong on interactive elements, but it nevertheless draw's players in to a powerful, but fragmented, narrative of a young girl's experiences of life in a concentration camp. Appropriate to the "Tiny Worlds" theme of the competition, The World of Marceline is quite confined. Players navigate the titular character, Marceline, back and forth past a brick background. As Marceline walks past different segments of the wall, pressing the up arrow gives the player a chance to interact with that segment of Marceline's past. A question pops up, and players have to choose how to respond to Marceline's emotions and reflections. 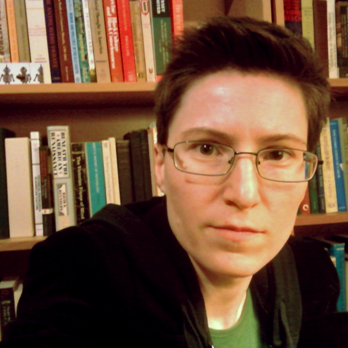 While the prompts are so highly interpretive that it seems difficult to say that there are any right or wrong answers, certain choices are more productive than others. Some answers transform the wall into an image and provoke reflection from Marceline, while others result in Marceline's walls crumbling down. From the game's very title screen, The World of Marceline employs interesting devices to draw the player into the horrifying world of a concentration camp prisoner. In a powerful rhetorical move, payers don't simply "press enter to start." Rather, players are prompted to "press enter to refuse," as in, refuse to be reduced to a camp ID number. Throughout the game, the ideas of resistance and dreaming are recurring themes, and successful choices seem to be those which help Marceline accept the reality of her situation without giving into defeatism. That being said, determining which choices will help Marceline do this is not always obvious. For example, "accepting" that she is alone causes one of Marceline's walls to crumble, and yet, acknowledging the humiliation of having her head shaved gives Marceline strength. On the one hand, this adds a certain element of complexity to the character of Marceline, but from the perspective of the player, it is difficult to predict in advance which choices will help Marceline the most. In this respect, The World of Marceline does not really fit the mold of a conventional game. It is interactive, but players are given no goals and there is no progression or gameplay development. Rather, it's a much more open-ended exploration of Marceline's inner thoughts and memories. Ultimately, I think The World of Marceline succeeds in being both emotionally evocative and philosophically provocative. Both the essence of how concentration camps worked to destroy human dignity, and the ways in which prisoners struggled to maintain some sense of self in the face of such humiliation are captured here. 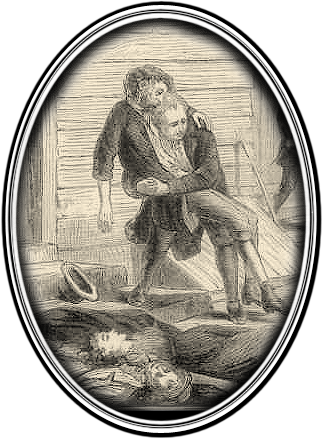 It is not a game in the most traditional sense, but it is a compelling interactive exploration of one of the darkest periods of modern history. World in a Bottle is a cute but challenging simulation that puts players in the position of trying to maintain life in a deceptively simple-looking closed ecosystem. Players have the ability to add three types of living organism into the game's oversized terrarium: apple trees, lupine plants, and rabbits. 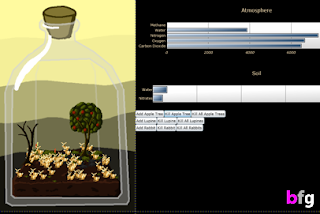 The challenge, of course, is to create balance within the world inside the bottle, and players can only do so by paying close attention to the bar graphs on the right side of the screen, which monitor various indicators of atmospheric and soil health like oxygen and nitrogen levels and the like. At first glance, the simulation seems simple enough to understand. Lupines fix atmospheric nitrogen in the soil, allowing trees to grow. Apple trees help produce oxygen that rabbits will need to survive, and rabbits consume oxygen and plant life in order to reproduce. The game is good at making transparent how adding each of these forms of life affects the conditions in the bottle, at least in the beginning when population sizes are small. However, achieving ecological harmony in the bottle is no easy task, and invariably both plant and animal populations will swiftly exceed what the little world's resources can sustain, and players must watch their ecosystem crash before their very eyes. Even though the potential occupants of the world in a bottle are few, the choices players must make to keep their ecosystem thriving still involves difficult choices. Sometimes, you must kill off the very things you've created (tragically, even the cute bunnies have to go sometimes). Sometimes, you have to watch those things die en masse when you don't selectively cull the population. Life in the World in a Bottle is harsh, but it is nevertheless realistic in that respect. I enjoyed that the simulation was simple enough that the message of how each different group affected the ecosystem was clear, even if there was no clear way to keep that ecosystem within sustainable limits. If World in a Bottle were ever expanded into a more complete game, it would be nice to see a few more guidelines about how the various components of the world interact. As the game stands now, I could never figure out what affected the atmospheric methane levels, nor did I fully understand how the water cycle in the game worked. It would also be nice if there were more ways to keep the various populations in check without having to directly intervene in the world, like by the addition of predators to the ecosystem. The rabbits might still have to die, but at least I wouldn't feel quite so evil as when I personally had to make the call for total rabbit annihilation in order to save the ecosystem from collapsing. Of course, the game's current structure does give players a sense of how impossible infinite growth is by forcing them to make deliberate choices about what populations to kill off in order to save the whole, and I wouldn't want to see that component of the game disappear. Still, I think that World in a Bottle has plenty of room to grow, and I hope one day to see a version of it with more options and more scenarios for players to explore. Mozi Life is not the most sophisticated in terms of gameplay, but it takes on such a unique topic in such an exceptional way that it seems quite deserving of the top spot among educational Ludum Dare games. Despite the tremendous impact that mosquitoes and mosquito-borne illnesses have on human health and economies worldwide, it's a sad truth that most of us know very little about the life-cycle of these pesky little creatures. Mozi Life helps to change that by making the life-cycle of a humble mosquito the basis of a charming interactive story. I call Mozi Life an interactive story rather than a game because, mechanically, there isn't a great deal of depth in the player's interactions. There are four stages of mosquito life currently represented: birth, larval growth, hatching from the pupa, and laying eggs as a full grown mosquito. Among these, the larval growth stage is very well-done, even if the other stages leave something to be desired. In the first stage, breaking free of the egg requires moving the mouse back and forth in broad, but quick motions. The motion is ultimately quite simple, but the animations don't do the greatest job of visually reinforcing what you are expected to do. Despite the instructions, momentum really has nothing to do with breaking out of the egg. In fact, the more the egg itself spins around on the screen, the farther players are from actually performing the correct motion for dislodging their larva. 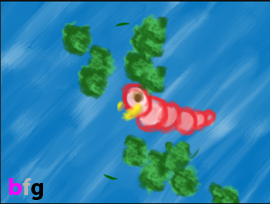 In the feeding stage, however, mouse-wiggling controls are used to much better effect as players control a hungry little larva looking for an algae snack. Players are rewarded by seeing their larva grow fatter and longer as you devour algae in your little pond. The hatch from the pupa stage is probably the most uninventive and involves only repeated mouse clicking, while the final egg laying stage is a bit too obtuse. If you're doing it wrong, there's very little feedback to guide you. If you do it right, however, you'll see an egg slide out of the mosquito's lower abdomen and the life cycle will repeat. Mozi Life is notable for both for the attempt to accurately portray the stages of a mosquito's life in an endearing way through the cute, stylized graphics, and for being a game that structurally mirrors the concept of the life-cycle, as success in the game means starting the cycle (and the game) all over again. The main disadvantage to Mozi Life in its current form is that the number of stages in the game are few compared to what else might have been included as part of the life cycle of the mosquito, but it is often the case with Ludum Dare games that initial ambitions get pared down dramatically in the interests of time. According to developer Claire Blackshaw's Ludum Dare journal, some of the originally planned stages included an adult feeding stage (finding a target and feeding on blood), a mating stage, and finding a water source for laying eggs. I truly hope that development of this game continues post-Ludum Dare, and that some of these omitted levels are incorporated. And perhaps too slightly more sophisticated gameplay might be introduced, like including time limits or predators as a means of introducing the challenges a mosquito faces over the course of its brief life. I think the results would be fun and fascinating little simulation to help both kids and adults understand more about mosquito life-cycles and possibly also about mosquito-borne illnesses. While I consider the games review this week and last week to be among the best educational games Ludum Dare 23 has to offer, both in terms of educational content and enjoyable gameplay, these are far from the only contenders. Listed below are some other notable games I discovered in making my top ten list. Even though they didn't quite make the final cut, they're still worth checking out. Feel free to recommend your favorite educational Ludum Dare games in the comments! I totally missed this paper. Thank you so much ! I was working on an improved version of The world of Marceline after the Ludum Dare, but I had to slow down because of my work and studies. I hope I will be able to release it sometime. Well thank you, Brice, for making such an interesting game. I hope you find the time to keep working on it, and for making more thought-provoking games in the future. Best of luck to you!